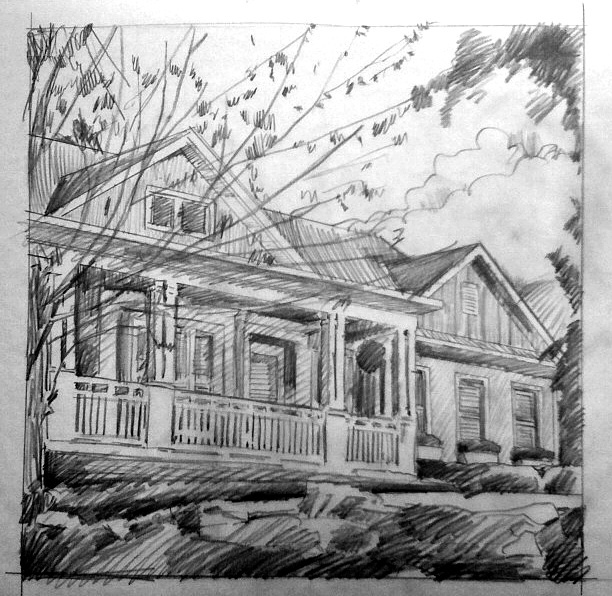 While I enjoy seeing architecture used in artwork, either as part of a landscape or as the featured object itself, I don’t really enjoy having to drawn or paint it myself. While I can draw pretty much anything, to this day I have a hard time drawing a straight line free-handed. And when you draw or paint a building, you need to have lines that are somewhat straight and consistently parallel to one another. Otherwise these crooked, odd angled lines stand out like sore thumbs. When I reluctantly agreed to paint a neighbor’s house (as a portrait of, not painting the trim), I took a look at the railing and window frames that abound the front of their home. I knew that I was taking on some subject matter that I’m obviously uneasy with. As with any “commission” I take on, I always offer a sketch to show the patron what I’m going to do and as a reference to myself of what I’m about to produce. So after coming up with a sketch, I re-drew or traced my initial sketch on drafting vellum so I could use a drafting triangle and ruler straight edge to capture the major outside edges. So now I’m starting an oil painting portrait of the approved composition, seen above. We’ll see how much of it I will be able to keep the subject matter on the straight and narrow.